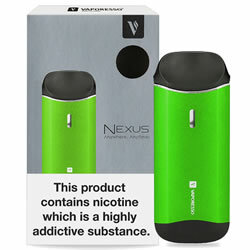 Vaporesso Nexus AIO - GREEN FULL kit buy from NUCIG UK. The Vaporesso NEXUS Kit by Vaporesso AIO all-in-one starter kit is designed for vapers on the go! This small and sleek e-cigarette kit is designed to make vaping easy, featuring a care-free filling system, an adjustable airflow system and a high performance CCELL coil. This MTL device, features a 650mah built-in battery and a quick charge system. 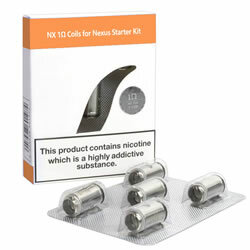 Very good value and is very easy to refill and use. Lots of smoke vapour is possible, and its size is perfect to carry round. Feels really natural in the hand and works like a charm. Well designed and performs very well. I like th eidea it has no need for button to activate, you simply take a drag and it works - all very natural.